This year, Mondelez India promises to bring alive the joy of gifting by bringing people together and strengthening relationships with gifting options like Cadbury Celebrations, Rich Dry Fruit Collection and Cadbury Favourites across its e-commerce platforms, traditional and modern trade outlets. Festivals form an intrinsic part of the Indian culture and Mondelez India, with its spirited campaigns, colourful packaging and unique product formats has been at the heart of India’s festive spirit for over 70 years. 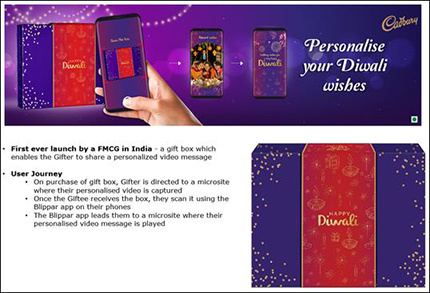 Through its path-breaking television commercials and unique storytelling formats, Mondelez India has created more occasions and given its consumers many reasons to gift the attractive chocolaty delight. This festive season, Mondelez India, together with its advertising agency, Ogilvy and Mather promise yet another heart-warming campaign, taking forward the proposition of Kuch Achha Ho Jaaye, Kuch Meetha Ho Jaaye. The television campaign (TVC), featuring youth icon Saba Sultana and web series fame Amol Parashar, along with veteran actor Tinnu Anand, brought back fond memories of the much-loved khadoos chacha ad. The one minute ad is set on a Diwali evening and features the young couple and their old and grumpy neighbor. On the occasion of Diwali, the couple decide to offer their neighbour some chocolates. The old man, who doesn’t want to be disturbed, has a signboard outside his house saying, “No borrowing, no disturbance, no strangers”. He is surprised to see the couple, but their sweet gesture touches his heart, and he opens the door to his house for them. Mondelez India, with its heart-warming campaigns hopes to connect with India and make small acts of kindness a part of everyday life. “Cadbury Celebrations brings alive the joy of gifting by getting people together and strengthening relationships especially during festivals like Diwali and Raksha Bandhan,” he added. “We aim to bank on the Cadbury Celebrations Premium Selection chocolates with revamped and premium packaging to help us connect with our consumers this festive season,” Viswanathan said. “Our new TVC, brings back a plethora of emotions, from shared values such as togetherness, to goodness and collective joy,” he added. “The TVC successfully reminds us of how any act of kindness, however little it is, can bring joy to people around you, thereby building on our strong proposition of Kuch Achha Ho Jaaye, Kuch Meetha Ho Jaaye,” Viswanathan said. The company has been making strides in e-commerce, creating new shopping opportunities through personalisation and gifting platforms. This festive season, the company has also designed an e-commerce innovation using personalisation to take the gifting experience a notch up. Consumers will be able to personalise their heartfelt messages digitally to create a truly special personalised gift for their loved ones.